About 20 percent of all insurance claims are related to water damage of some kind. Damage to property due to floods and excess water can interrupt businesses, resulting in the loss of sales and customers. The annual cost to insurance companies for water damage is around 2.5 billion dollars. This is a lot, especially considering about 93% of water damage can be prevented. 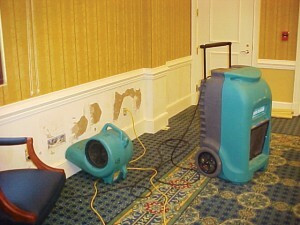 Water damage restoration is something that a business doesn’t think about until it happens. 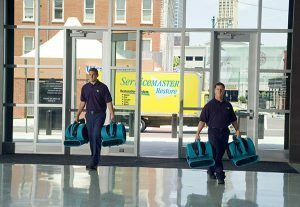 When water damage occurs and your business requires action, you need to call an expert water damage restoration service provider like ServiceMaster Restoration and Cleaning. We will help minimize the losses to your company and get you, your employees and your customers back in business as fast as possible. How long does water take to dry? Will the wood floors and carpet be saved? What is the process to clean up from water damage? Drying time is determined by a combination of factors including the location, duration, and source of the water; the types of building materials affected; the weather conditions; and most importantly, how quickly emergency services begin. There are no rules to determine how long your property will take to dry, we can tell you it may take between three and five days or more, depending on the conditions. Proper testing with specialized equipment is the best way to determine if things are completely dry. Your carpet may feel dry to the touch, but the padding and subfloors may still be wet underneath. Your carpet may not be salvageable because of delamination, which occurs when the backing separates from the carpet fiber. Loss of adhesion may be caused by prolonged exposure to water, especially in older carpeting. Sewage contamination and stains can also ruin your carpet. If the carpeting covers wood flooring, the condition of the carpet could affect the wood underneath. In this case, the carpet may need to be removed to salvage the wood. When your carpeting is restored, the damaged pad underneath will be replaced with the same or a similar pad. In this case, a sample of your pad is brought to our office to find a match. When available, an identical pad will be used. When your original pad is not available, we will provide a pad of the same quality, thickness and density. We use air movers and dehumidifiers for the most efficient drying. When water damage has occurred, water can be absorbed into the drywall (sheetrock), baseboards, subflooring, etc. Drying these surfaces requires high velocity air movers to accelerate the release of absorbed water into the air. Dehumidifiers are necessary for removing this excess moisture to help protect property and create conditions for efficient drying. Our water damage mitigation specialists will place and monitor the equipment to achieve optimal results in the shortest amount of time. The drying and dehumidification equipment also doesn’t cost much money to run. Based on average electrical rates, it may cost about $1 per day per piece of drying equipment to operate. Actual costs can vary depending on current rates from your local electricity provider. Mold needs a moist environment, temperatures above freezing, and a food source, which can be leaves, paper, dirt, wood or other building materials. Mold is more likely to be found in damp, dusty spaces or areas with stagnant air. Many people aren’t aware that mold can cause structural damage to homes and businesses, which, if left undetected, can cause a property to lose value and/or require significant repairs. And if you have ever suffered from allergies, exposure to mold can often cause nasal stuffiness, eye irritation, wheezing, skin irritation or even more severe reactions. If you see mold growth or water stains, a mold test can help identify related microbial activity. You can also look for areas where water leakage has occurred, such as roofs, pipes, ceilings or walls. Musty smells may also indicate the presence of mold. Most experts recommend a professional mold remediation company when elevated mold levels are detected. Remediation professionals are specially trained to isolate and treat mold-affected areas to avoid contaminating adjacent spaces. If mold is present, the Centers for Disease Control and Prevention have strongly recommended that it be removed, no matter the type. Stay updated with your water heater on a regular basis. Have a it maintained by a plumber. A quick fix to stop water is to ensure your hoses on appliances are not worn. Your washing machines, dishwashers, and icemakers are some appliances that have hoses. Check up on your toilets. A continuously running toilet can waste over 200 gallons of water per day. Toilet leaks or toilet overflow can lead to costly water damage and mold issues. When pipe leaks occur, turn off the water. Make sure your employees know how to shut off the water in the building. Being aware of how your business can handle water damage cleanup is the first step of ensuring your business is protected. Since one burst pipe can cause major damage to your business, remember that you need to take action immediately to prevent serious, costly damage. Our water damage restoration experts at ServiceMaster Restoration and Cleaning can help businesses recover after any amount of water damage from leaks to indoor flooding. 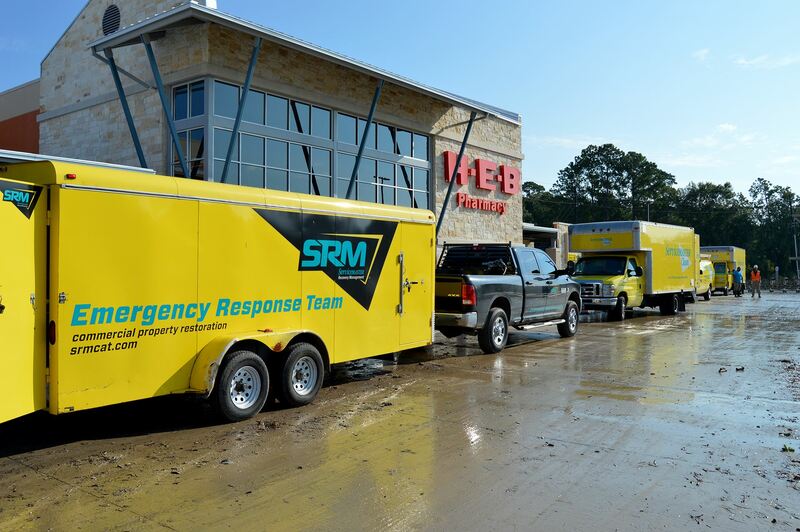 This 120 unit condominium community was one of many properties flooded during Hurricane Harvey and ServiceMaster Recovery Management was called upon to help get them back. You can reach ServiceMaster Restoration and Cleaning 24 hours a day by calling (800) 303-5844.